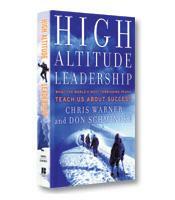 Chris Warner and Don Schmincke present a new approach to leadership development, based in groundbreaking scientific research, field test under the most brutal conditions on the most difficult summits, and successfully applied in the training of executives, management teams and entrepreneurs throughout the world. To thrive in today’s business challenges and tomorrow’s unpredictable risks, you need to become the type of leader whose career, team, and company excels in the most extreme of environments. You have to be a High Altitude Leader who uses every bit of your talent and every ounce of your strength to guide your team to peak performance. This book summary will show you how. What dangers are encountered when getting to higher altitudes in the mountains or in the business environment. What you can do to survive them and how you can prevent them. How to lead groups to perform at the peak of their ability in the most extreme circumstances. How to develop leadership skills to excel in the most extreme environments.